Pin4Ever is a set of power tools for Pinterest that help you quickly protect, organize, create, and upload your pins. 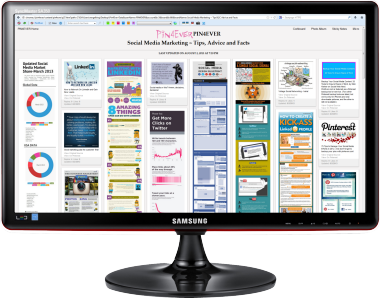 If you love Pinterest, you need Pin4Ever! You must be using Waterfox or Palemoon or Firefox 56 as a browser. If using Firefox 56, it is important to disable updates. Open Waterfox, Palemoon, or Firefox 56, then go to Pin4Ever.com. If you have upgraded to Firefox 57, Pin4Ever will be disabled. Please click here for installation options. TROUBLE INSTALLING? Click here for help. 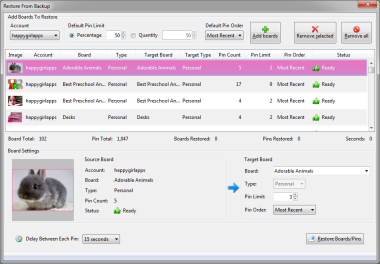 Most of Pin4Ever's features are absolutely free and do not expire. 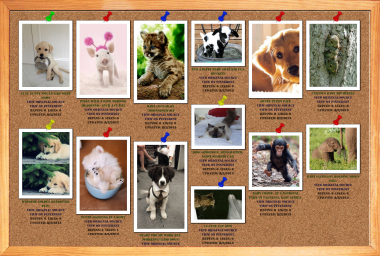 However, we do ask you to pin one of our pins to one of your boards once a week, if you do not have a paid plan, to help us with promoting Pin4Ever. With a free or paid plan, you can run your backups within the time period, then keep and view the backups as long as you like! Paid plans include a 15 day money back guarantee! We also do ask that you use the Free Trial Plan for a week before purchasing a paid plan. Plans do not automatically renew, but we do hope you will come back again! Each plan is for one Pinterest account only. There is a transfer fee if you want your plan switched to another Pinterest account or username. Backup all of your boards, or each board individually, including Likes, Followers, and Following. See your backed up pins in different styles, including Sticky Notes, Photo Album, Corkboard, Classic, and Micro. 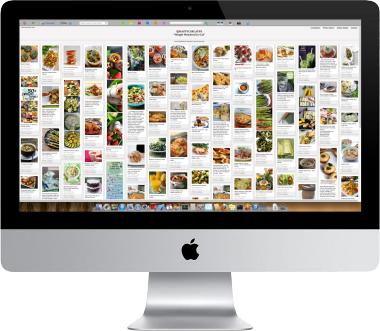 Pin multiple images from your Etsy and eBay stores' product listings with just a few clicks. Filter listings by categories, keywords, price, and sort order before promoting with an optional time delay between pins. Automatically add your eBay affiliate id to every pin link to earn money by uploading eBay store inventories to Pinterest! Backup your pin's linked web pages as HTML. View the web pages in your backup, even if the original linked web pages have changed or no longer exist. Backup your pin's videos as MP4 files. View the videos in your backup, even if the original videos no longer exist. Restore all of your boards to Pinterest, or each board individually, combine multiple accounts, and combine boards from your Pin4Ever backups. 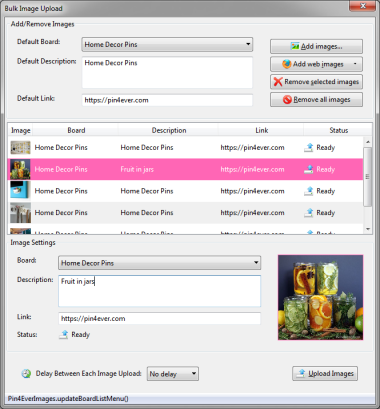 Pin multiple images from your local drive or images from the web, including Facebook, Instagram, Pinterest, and other sites, with an optional time delay between pins. Quickly follow back and/or unfollow back Pinterest pinners from your account or others. Follow/unfollow all of your Followers, follow all of another pinner's Followers and/or Following, follow all of a board's Followers, and unfollow pinners that you are following that are not following you, with an optional time delay between each follow/unfollow. Whitelist pinners to never unfollow, and blacklist pinners to never follow. 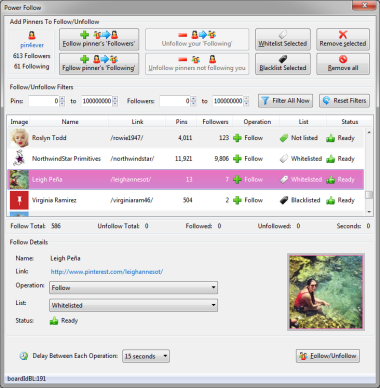 Filter pinners by their amount of pins and amount of followers. After running a backup, this will find any pins that have links that no longer work. Update descriptions and/or source links on multiple pins simultaneously. Cleans your home feed by removing related or recommended pins. Printing Pinterest pages and having them look normal has become impossible. This new feature allows printing of Pinterest pages, and also allows printing other dynamic pages, such as the Pin4Ever backup pages. Rate pins from one half to 5 stars to mark your favorites and to better organize pins, whether you pin them or not. View rated pins any time and sort your backup pins by your rating. After running a backup, this will find any duplicate pins and show them side by side, so that you can decide which ones you want to keep. Remove unwanted duplicates in bulk, using either Kill or Delete and Discard. After running a second backup, this will find any pins that were deleted from Pinterest. You can then click Upload to put them back on Pinterest. See if the people that you are following are also your followers or not. You can then unfollow them if you choose. 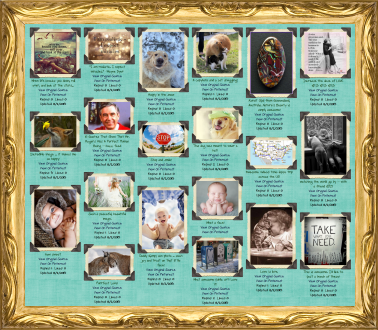 Quickly design and pin quotes, infographics, announcements, or just a fancy image. Combine multiple images from your local drive, images from the web (including Facebook, Instagram, Pinterest, and other sites), built-in patterns, and colors. Add text, in different fonts, sizes, colors, shadows and styles. Pin pages that don't have any pinnable images by taking a screen shot of any part of the page. Click once and it will keep scrolling down those long Pinterest pages, so you don't have to! It also works on other websites. Restore multiple pins that were deleted from Pinterest, or upload existing pins to new boards. After running a backup, use the power search to quickly search for pins using words, phrases, and even the links. Also searches pins that have been deleted from Pinterest. 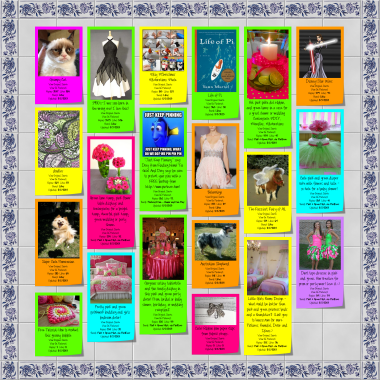 See your most popular pins (most repinned and liked) on this automatically generated board. Sort them in reverse order to quickly remove low performing pins in bulk, using either Kill or Delete and Discard. Sort your backed up boards alphabetically, by size, or by backup date. Sort your backed up pins by popularity or backup date. Sort your search pages, and deleted pins also. 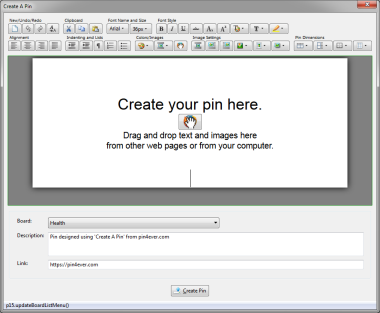 Pin4Ever runs on Windows, Mac, and Linux computers as an extension to the Firefox web browser. Backups can be saved to any device and kept forever. Use the software wherever you like, with no installation limits. We use for payments, so you can buy with confidence, knowing your financial information is secure. "I just did the free trial and it put all of my pins in jpg in their own boards on my computer. I am still in amazement!" - Brenda E.
"I needed peace of mind with a backup, as I have 6,000+ pins that I use as motivation and inspiration. I'd be really sad to lose them." - Nick G.
"THANK YOU for all your awesome customer support while I figured things out. YOU are the type of company I always want to do business with. I am more than happy to pay for awesome programming backed up with first class support. You are all that and more.." - Richard A. "The program works perfectly... I want to thank you for excellent Support, your patience, and kindness. Also for the 7 day free trial to see if its for me or not... A pinner on Pinterest CAN NOT do with out this program...I will be spreading the word every chance I get. Thank you again, Your loyal customer," - April L.
The Pin4Ever Basic Tools video starts with showing the ease of the Pin4Ever installation, and automatic sign in. It then demonstrates running a backup, and then shows each of the basic Pin4Ever features in action. The Pin4Ever Restore From Backup video demonstrates the features and use of the Restore From Backup tool restoring boards and pins to Pinterest from a Pin4Ever backup. The Pin4Ever Power Follow video demonstrates the features and use of the Power Follow tool doing bulk follow backs of Pinterest users and other follow/unfollow features. The Pin4Ever Bulk Image Uploading video demonstrates the use of the Bulk Image Uploading tool uploading images to a newly created board.